View looking north through the courtyard of the Mevlana Complex. On the right note the ablution fountain—sadirvan. To the right (east) of that is the building the houses the tomb of Mevlana and members of his family and some early followers. 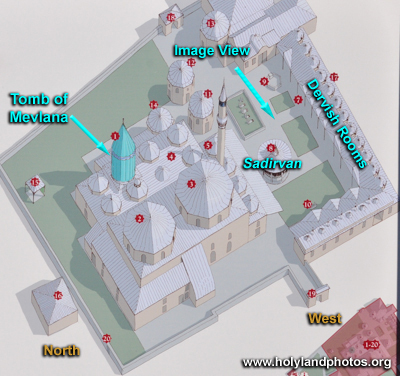 On the left (west) and behind the evergreen trees are some of the rooms of the Dervish Cells.